The furin is made from nambu cast iron. It can be a great gift for any occasion. 6-7/8"L x 3"W x 1-3/4"H. The bell is approx. It is well-made and detailed. The furin is made from nambu cast iron. It can be a great gift for any occasion. It is well-made and detailed. Chakra growth & personal power. When your Solar Plexus Chakra is open . colorful stone associated with a particular Chakra. Citrine represents the Solar Plexus. Citrine is a symbol of hope and youth and. 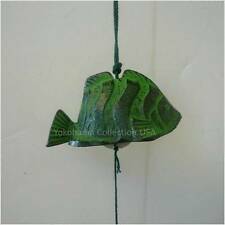 The furin is made from cast iron. It can be a great gift for any occasion. 2.75" x 1.5" (6.5 cm x 4 cm) and approx. 13"entire length. Hi! Welcome to Weaim2pleez. Here is a Kneeling Angel Windchime. Made of weatherproof resin. Measures 3 1/2" (8.89 cm) x 3" (7.62 cm) x 4 1/2" (11.43 cm). BRAND NEW in box! BUY IT NOW!! . Wind Chime. Do not have the original box. The furin is made from nambu cast iron. It can be a great gift for any occasion. 6.25"(W) x 6"(H). The bell (owl) is approx. It is well-made and detailed. squirrel wind chime copper patina hand made all steel construction. The three graceful petals of the windcatcher are reminiscent of flower filled arbors. Joyful tones, natural shapes and beautiful color contribute to the overall appeal. Made from ash wood and aluminum. Feng Shui ; Mother Natures Wood Song. This has been used and does need a little cleaning. This is in excellent condition for its age. None of the individual pieces have full breaks (hairline fractures) or unsightly loss. The nylon string holding the glass prisms to the piece of driftwood is hand-tied through carefully drilled out holes in the upper corner of the fish or glass prisms. 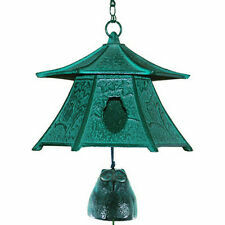 The furin is made from nambu cast iron. It can be a great gift for any occasion. 2.5"x1.25" and 23"entire length. It is well-made and detailed. And to help relax the mind and. Dark finish ash wood. to hang anywhere. 4 silver anodized aluminum tubes, blue crystal. and beautiful crystal accents. they are delectable little treats. If purchasing from other countries. The furin is made from nambu cast iron. It can be a great gift for any occasion. 4.75" x 2" (12 cm x 5 cm) and 15"entire length. It is well-made and detailed. Nearly 3 feet long from top to longest seashell strand. It has a beautiful and peaceful sound as the shells blow in the breeze. This beautiful wooden wind chime was crafted from bamboo in Bali Indonesia. At the top of the piece is a painted crescent moon, and below are 5" goddesses and 2.5" moons that hang among bamboo cylinders. 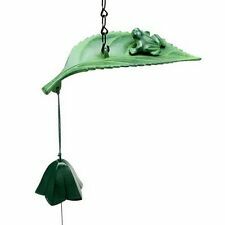 A truly unique wind chime for your garden. 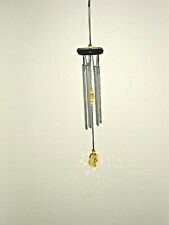 Main section of wind chime measures 37" Total length 57" This wind chime was handcrafted in Indonesia, where the climate is usually hot and humid. When submitted to extreme changes of temperature or humidity they are susceptible to crack. Minor cracks are considered a condition inherent to these products, and will not affect the gentle sounds created by a nice summer breeze. A gentle tap of the mallet - - -. Good vibrations from this trio of tuned bars. 3 Angel Bell Wind Chime Metal Glass Bead Cowerie Shell Primitive Folk Art 27"x6"
This item is decorated with glass beads and natural cowerie shells and has 2 brass bells. The beads are blue and black and white. This is a pre-owned item in good order. It has a serene sound.My photos are of the actual item you are getting. I will do my best to resolve any problem. Monitor resolutions are different therefore colors might differ slightly. The wooden piece alone stands 7" high, 3" across the top 10" around. Beautiful colors very beachy/nautical. Birds are all signed and dated 1979. Blue Moon and Star Shaped Polished Agate Slabs with Bamboo style hanger. These slabs and make a nice ting when dangled by a breeze. A festive look. These are real beauties! Size : Agate Slab shapes average 2" - 3". This sturdy wall hook mounts with two screws, included. A festive look. These are real beauties! Nice used condition. This kit requires assembly. Includes only what is in photos. Wire is not included. See photos for actual condition. WE WILL MAKE IT RIGHT! The furin is made from nambu cast iron. It can be a great gift for any occasion. 16"entire length. It is well-made and detailed. A festive look. Grade : A Grade Agate Slabs. Size : Slabs average 3". Not sure if these have ever been used or not as I found them in the original manufactures box in a storage locker. Vtg Wind Chimes Ceramic Heart 4.5" X 4" w/chimes 5" Welcome to my Garden "
The furin is made from nambu cast iron. It can be a great gift for any occasion. 1-1/4 x 10 x 1-3/8", the bell is approx. 2 x 2" and 23.5"entire length. It is well-made and detailed. I am not able to do this any better due to my circumstance. Hand crafted by master Balinese artisans. of art and will vary slightly because each piece of natural wood is different.